I hope you know that in Windows we don’t have any default spell checker . So if there is no office suites like MS Word or OpenOffice , it is pretty difficult to find out related suggestions for misspelled words . We encounter this difficulty when writing notes with Notepad and Wordpad .So here you can download Spell checker software for Windows Notepad , Wordpad , search and other . 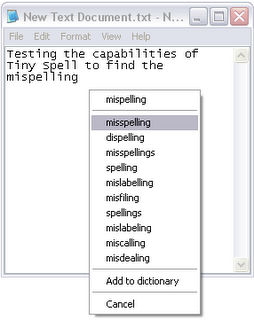 Tinyspell, automatic spell checker and correction tool for Windows is very small in its size and in memory usage . Tinyspell integrates itself into all Windows applications including Browsers , Search buttons , Notepad , Wordpad and other softwares using type functionality . It has a very database of English Words and any user can contribute to the database . So next time these words will also appear in spell suggestions .Tinyspell has both freeware and shareware versions . 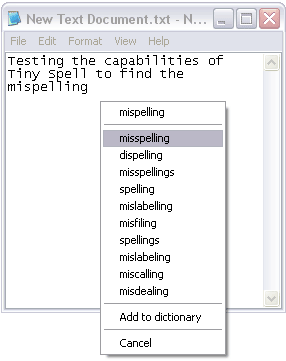 Download Tinyspell spell checker for Windows .